KNOXVILLE, TN--(Marketwired - Mar 28, 2016) - What's better than one Blaze Fast-Fire'd Pizza? Two Blaze Fast-Fire'd Pizzas! Fortunately for Knoxville residents, this dream is now a reality. Today the nation's leading fast-casual artisanal pizza concept, known for its chef-driven menu and casually hip restaurants, opens its second Knoxville location. The new restaurant is conveniently located in the Turkey Creek shopping complex at 10978 Parkside Drive, between Chick-Fil-A and Starbucks. To celebrate, diners are invited to enjoy a free, custom-built, artisanal pizza on Tuesday, March 29 from 11:00 am to 9:00 pm, simply by following Blaze Pizza on Instagram, Snapchat, Twitter or Facebook. Blaze Pizza is a modern day "pizza joint" that has been inspiring excitement and cultivating fanatics for its custom-built artisanal pizzas, freshly made salads, blood orange lemonade and s'more pies since it opened its first location in 2012. Each restaurant features an interactive open-kitchen format that allows guests to customize one of the menu's signature pizzas or create their own, choosing from a wide selection of carefully sourced, high-quality ingredients -- all for around $8. The generously-sized personal pizzas are then sent to a blazing hot open-flame oven -- the centerpiece of the restaurant -- where dedicated pizzasmiths ensure that the thin-crust pies are fast-fire'd and ready to eat in just 180 seconds. "Knoxville has quickly become one of our most significant markets for growth for Blaze Pizza nationwide," said Mike Forte, Knoxville resident and Blaze Operating Partner in Tennessee, who first brought the concept to the Volunteer State back in 2014. "Knoxville diners in particular have embraced the quick but high-quality dining experience offered by Blaze that you won't find at any other pizza restaurant." Each restaurant makes its own dough from scratch, using a recipe developed by critically-acclaimed Executive Chef Bradford Kent (the "Pizza Whisperer"), which requires a 24-hour fermentation period to produce his signature light-as-air, crisp crust. For pizza fans with specific dietary needs, Blaze Pizza offers gluten-free dough and vegan cheese. The new Knoxville restaurant will also offer a selection of beers. The authenticity of Blaze Pizza, along with its culture that genuinely focuses on the happiness of their guests and crew, has been the key to the concept's popularity and expansion. Blaze's close attention to detail extends well beyond the food, as seen by its carefully considered, modern approach to restaurant design. Award-winning design architect Ana Henton has added several unique, modern touches to the second Knoxville location, including an oversized, custom wall mural designed to suit the space. The new Knoxville location will be the third "Blaze Blue" location to open nationwide. "Blaze Blue" locations have updated branding to incorporate the color blue into the restaurant's traditional orange and black color scheme. Driven by its commitment to "Intelligent Choices for Our Pizzas, People & Planet," the restaurant will be constructed with recycled and sustainable materials, use eco-friendly packaging and feature energy-efficient LED lighting. The 4,000 square foot interior will include seating for more than 100 inside and additional seating on an outdoor patio. 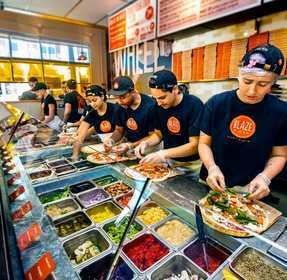 The new Knoxville Blaze Pizza will be operated by Louisville, Kentucky based Millennial Restaurant Group, which continues to develop the concept throughout Tennessee, Kentucky and Florida. The partnership consists of James Patterson Sr., Jim Patterson II, Ulysses (Junior) Bridgeman, Wayne Albritton and Collins Cogan. The first Blaze Pizza® restaurant opened on Aug. 6, 2012, in Irvine, Calif., and quickly gained attention for its chef-driven recipes, thoughtful interior design, and a service culture that celebrates individuality. Now ranked as the overall #2 fast-casual brand in FastCasual.com's annual Top 100 list, Blaze Pizza is building momentum and developing a cult-like following as it expands across the country. The company currently operates 118 restaurants in 27 states and Canada, including the major metropolitan areas of Los Angeles, New York, Chicago, San Francisco, Toronto, Dallas, Las Vegas and Washington D.C. Founded by Elise and Rick Wetzel (co-founder of Wetzel's Pretzels), the concept is backed by investors including LeBron James, Maria Shriver, Patrick Schwarzenegger, Boston Red Sox co-owner Tom Werner and movie producer John Davis. For more information, please visit blazepizza.com and facebook.com/blazepizza or click here to view a company video.